At night, everything feels more intense, the atmosphere changes to one that is ethereal and otherworldly. You’re not in your daily routine, or out and about with people. Friends and family that you count on to talk you through the experience might be asleep and unavailable. You can feel alone and desperate. However, there are ways to manage these attacks. Personally, I’ve found that using these techniques has drastically cut down the amount of night-time panic attacks I have, and for those times when they do still happen, I’m better prepared to manage them. I now haven’t had a serious panic attack one in 18 months, so I hope this can help you too. It’s important to know that it’s a panic attack, and although it might be painful and distressing, it won’t kill you. I’ve been taken to hospital by ambulance twice because of the unrelenting pain I was in. Both times the pain was so bad I thought I was having a heart attack. I’ve spent hours having multiple tests to find what was wrong, for everything to come back clear. What I know now is that although I have found myself in a great deal of pain, it won’t turn into anything sinister. I talk myself through the situation by repeatedly telling myself this, and saying it with conviction. When you realise what is actually happening, it becomes much easier to rationalise and get through it. Waking up with a panic attack can be very scary, and in the moment it can feel easier to stay in bed and try to wish it away. But the experience can be all the more intense if you lie there, with nothing to distract your mind. For me, lying in bed in the dark during a panic attack seems to exacerbate my feelings, as I run through all the worst scenarios in my head. I find that getting up, turning the light on, and going in to another room is much more constructive. Even if it’s just walking to the kitchen to have a drink of water and to do something, anything, rather than staying in bed worrying. If thinking logically doesn’t work on its own, and I’m up and out of bed, I’ll try to distract my mind. We all have something in our lives that helps us relax and takes our thoughts somewhere else – it might be as simple as taking a shower or bath. For me, it’s watching a TV show, something light and entertaining that I’ve seen before. Sometimes I sketch, which keeps my hands busy and forces me to focus. If I occupy my mind effectively and for long enough, I won’t even realise the pain and panic has gone. Distracting yourself from a panic attack seems simple, but it takes practise. If you’re already thinking logically about what’s happening, it will be easier. I had cognitive behavioural therapy (CBT) to manage my panic attacks, and to understand why I was having them so frequently. Therapy helped me to realise that I wasn’t dealing with stressors in my life, and that my worries and anxieties were manifesting as panic attacks. I learnt to face what was causing me stress and to deal with it there and then. I realised my panic attacks often occurred after a stressful event. Once my body and mind were relaxed again, like going to bed on a Friday night after a difficult week, I would wake up with a panic attack. It became vital to realise when I was going through a stressful time, so when that stress had disappeared I wouldn’t end up having yet another night-time attack. I was taught breathing techniques to calm myself, which I still use today. Katie is a blogger and freelance writer, focusing on mental health. She blogs at stumblingmind.com and has a podcast, ‘A Life Lived Vividly’, with a focus on hearing voices. 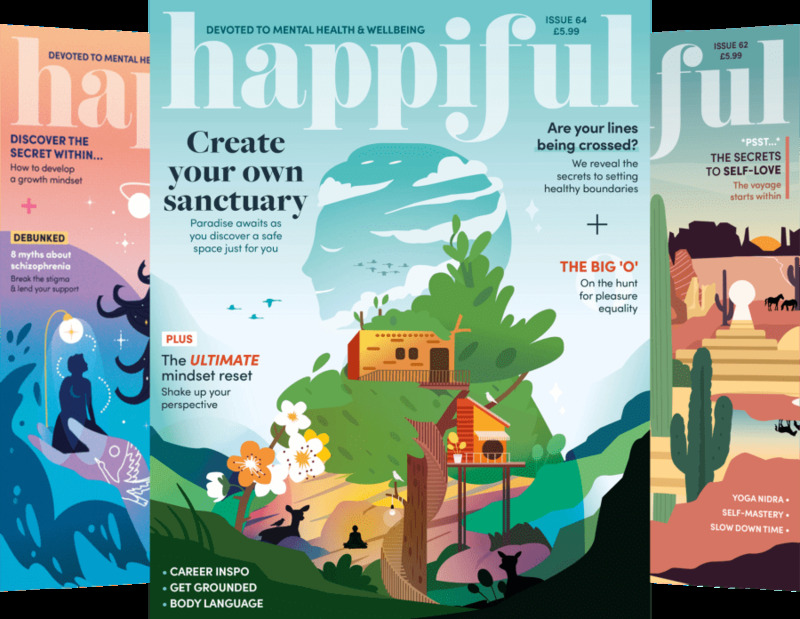 Katie is a contributor to the Novemeber issue of Happiful.